So the other day, I was tooling through Steam when I spotted a newly released game called Chroma Squad. It was in my queue of suggested games and I almost clicked past it, but then I noticed that its trailer had real human actors in it doing…well, I wasn’t sure what. So I stopped to watch it. Ohmygoodness. 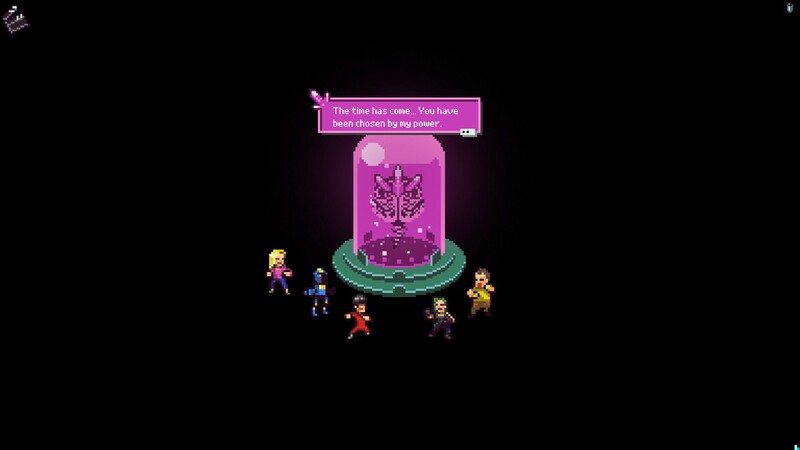 It’s a super sentai RPG! If you’re not familiar with super sentai…well, you obviously don’t live in our house. Or have little kids who like Power Rangers. Basically, super sentai is the Japanese show that gets ‘ported into America and becomes the various iterations of the Mighty Morphin’ Power Rangers. My boys have watched a couple of the various Ranger shows and, if I’m being honest, I’ve watched with them. So when I saw this game (plus the fact that it was on sale at the time), I figured I had to get it. I’m glad that I did. It’s a fun little game. It even has a story (as much as any Power Rangers show could). 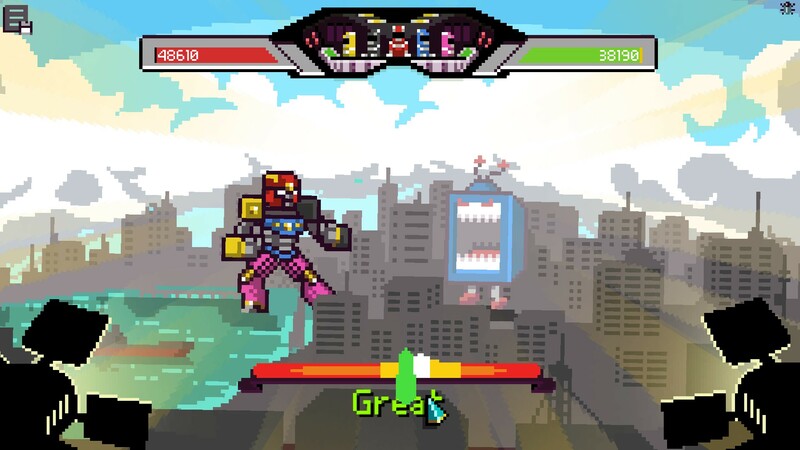 Basically five stunt people are sick of working on a super sentai show, so they decide to quit their jobs and open their own studio and produce their own super sentai show, one entitled Chroma Squad. They put together props and costumes using duct tape and cardboard and find friends who are willing to dress up as monsters and fight them, all so they can try to get as many audience members watching as possible. But then, after a few seasons, things start to take a decidedly real turn. And what once was supposed to be a simple TV show becomes a fight to protect the Earth. So in some ways, this is a very silly game. If you’ve watched any sort of Power Rangers, you know the drill. A monster-of-the-week shows up and causes trouble. The heroes show up and fight the monster and its assorted minions. Once you’ve beaten the monster once, it grows to super size and you have to summon your mighty mecha robot to fight them a second time. Rinse, lather, repeat. The game itself has a retro feel to the graphics and the fights aren’t exactly complicated. You pick your five actors (all of whom have their own special abilities) to fill the different roles of the squad. And then you wind up fighting a monster and an assorted variety of minions in each episode you film. To make things a little more challenging, you’re given instructions by the director (such as defeat all the minions before you defeat the monster, or finish the fight in so many turns) which, if you fulfill them, will give you bonuses to how many people are watching your episode. The size of your audience matters, because those numbers get converted into cash, which allows you to upgrade your studio and the equipment you use to film the episodes. Or you can use it to purchase upgraded armor or weaponry. But that isn’t your only option if you want to make your team better. When you defeat enemies, they drop items like duct tape, cardboard, and other items that you can then craft into weapons and armor. In a lot of ways, this is also a very simple game. There is a limited number of minions that you’ll see throughout the game and our heroes do not have a large repertoire of moves in those fights. The mecha fights are even more limited, where you basically chain together successive punches and block the monster’s attacks with a twitch-based game. But in spite of the game’s simplicity, it’s still a lot of fun to play. It’s got a quirky sense of humor that pokes fun at a lot of different things found in pop culture. 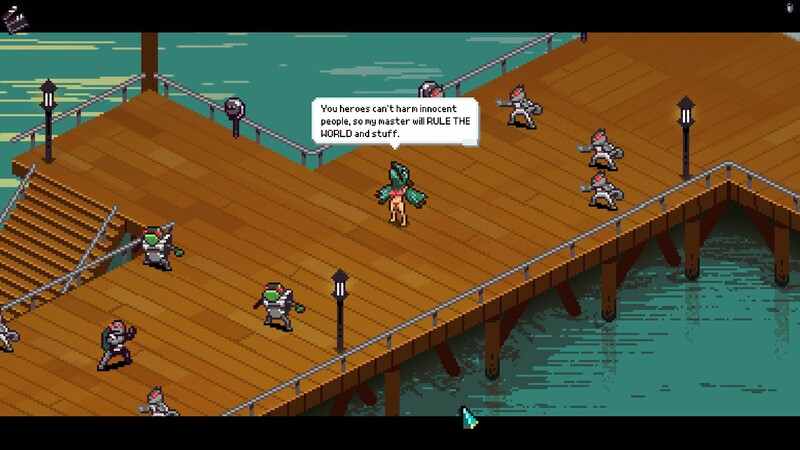 It’s also willing to break the fourth wall from time to time to make things silly, such as when one of the game’s developers appeared in the middle of a fight to help defeat a buggy villain. All in all, it’s a fun game that has three different endings (three!). I’ve seen one, so you better believe I’ll be going back in to try to find the rest.